This page is written by the game's inventor, Joe Joyce. This is a very slightly 3-dimensional game. It uses 2 mobile squares, the "C.a.B.s", that travel above the rest of the gameboard. These 2 squares allow the pieces to "Combine and Breakdown" anywhere on the board. This is an entry in the CVPages 45-square contest, whenever it may be run. The above paragraph was written 12/4/2005, according to the date stamp on the earliest version of the rules I found on my computer. This game has a lot of similarities to Doug Chatham's entry and I wish to here state that both games were designed entirely independently. This and Texas Two-Step were actually 2 of my earliest designs, but they were shelved because there was no 45 Square contest. When the 45-46 Square contest was announced, I dusted off the rules, created presets, and waited for my son to get around to turning what I did into a CV game page. This game was inspired by David Jagger's excellent game PiRaTeKnIkS, a submission in the 44 Square contest; and by reading something Fergus Duniho wrote about fusion chess. The shape of the board was inspired by a subway map of Manhattan Island. The board is a 7x9 rectangle missing 2 triangular pieces of 10 squares each from diagonally opposite corners, the a1 and g9 corners specifically. At the start of the game, the two taxis are placed just off the board, behind their respective kings. There are 43 'normal' board squares, plus the two 'taxis', making 45 squares on a slightly 3-dimensional board. K - king - This is the standard chess king, moving one square in any direction. R - rook - this is the standard rook, moving orthogonally any number of squares. B - bishop - this is the standard bishop, moving any number of squares diagonally. N - knight - This is the standard knight, moving one square orthogonally and then one square diagonally outward. P - pawn - This is the standard pawn, moving one square orthogonally forward, and capturing one square diagonally forward. A pawn that has not yet moved may make a double step forward as its first move. This pawn may be captured on the immediately following opponent's move by an opponent's pawn through en passant capture. Taxi - The taxi is a mobile board square. There are two taxis, one black and one white. The white cab may only be used by the white pieces, and the black cab only by the black pieces. If it is empty, any friendly piece can "call a cab". The cab moves to the calling piece, using that piece's movement modes. The cab must pick up the calling piece on the turn it is called. If it cannot, it cannot be called. The taxis operate above the level of the rest of the board. They are never blocked by pieces on the board, as they move above such pieces. They are blocked by the other taxi, if it is in the path they need to take. A taxi may never move into or through the other taxi. A taxi may contain up to 3 pieces. It may move as any one of the pieces it contains. If it is not full, but has at least one rider, it may pick up passengers using the movement of any riders or the piece it is going to pick up. A taxi may let off any number of passengers at the beginning or end of its move. It may pick up and drop off passengers on the same turn, and even on the same square. For example, a taxi containing K+R+B can be called by a knight that is a knight's move away, and the taxi may drop off one, two or all three passengers on the square it started on, or on the square where it picks up the knight, or any combination of the two squares. The only restrictions are that the knight must be in the taxi at the end of the move, and there cannot be more than 3 riders in the taxi at any time. All passengers that leave the taxi together stay on the same square where they got out. So, a taxi may start a turn with (up to) three passengers, and end the turn with (up to) three different passengers. If a taxi containing any friendly pieces ends its' move above/on the same square as any enemy pieces, these pieces are not captured or removed from the board. Any two pieces may be combined by sharing a taxi, which creates a dyad piece. If the two pieces are dissimilar, the dyad moves and captures as if it were either one of the pieces, at the owner's choice, each turn. The dyad may not move as one piece and capture as another. So, a B+P may move and capture any number of squares diagonally, or move 1 square orthogonally forward, without capture. If the two pieces are the same, they gain augmented movement and capture abilities. N+N - This combination moves as a knightrider, a continuous series of knight moves, 'all in the same direction'. P+P - This combination may move and capture orthogonally or diagonally forward. Optional Rule: In addition, P+P may move but not capture orthogonally sideways. Any three dissimilar pieces move and capture as any one of the pieces making up the triad. The triad may not move as one piece and capture as another. If a triad contains 2 of the same piece, it may move and capture as that augmented double piece. So, P+N+P may may capture one square orthogonally forward because it contains two pawns. P+P+P - Three pawns may move and capture diagonally forward, orthogonally forward, or (orthogonally) sideways. Optional Rule: In addition, P+P+P may move but not capture diagonally backwards. The taxis are located in single squares behind the opposing kings. These squares are considered the taxi's respective garages and are NOT playable squares. Technically, these two squares are the taxis, and are located a level above the other 43 board squares. These squares only exist where they are until the taxis "leave the garage". Once a taxi leaves the garage, no piece, including the taxis, may enter that space for the rest of the game. Opposing pieces may never simultaneously occupy the same square. A taxi may not let passengers off in an opponent-occupied square. So pieces may never capture other pieces by getting out of a taxi. A combined piece is always treated as if it were a single unitary piece for all purposes of movement and capture. This may not be a valid entry for the 45-46 Square Contest, because there may only be 43 squares here. The 2 taxis are not sure if they are squares pretending to be pieces, or pieces pretending to be squares. The board squares on the preset will each hold up to four piece icons. Pieces always move from board square to board square. They may freely change their positions within any single board square, as this positioning within one square is irrelevant to the game. Or is the phrase 'well struck'? As far as the number of squares actually in the game, I feel a certain amount of ambiguity is good for the soul. I was quite happy to see Doug Chatham's ambiguous square count turn up in the contest. As for the possibility of allowing the 2 taxis, with or without passengers, to end a move orthogonally adjacent to an edge board square, well, the board was modelled after a [poor] map of Manhattan, which is surrounded by water. In fact, when the 45 square contest never materialized, I considered adding 3 7-square rows to the middle of the board, changing the one black and one white taxi [remember Black and White Cabs?] to two Checker[ed] cabs, usable by either side if empty and callable, and calling that variant 64 [not 66] square Manhattan Taxi Chess, since the board would more closely resemble that poor map of Manhattan. This concept precluded me from even thinking of your idea, Charles. It is a perfectly viable optional rule, however, and does fit in well with the 45 square theme. Thank you for pointing it out. Grin, shows how blind a theme can make you in design. Charles, well hit. Truthfully, I never considered the question of pawn promotion when I finished this up for posting. Embarrassing to admit, but there it is. I kept going back to the game with the feeling that something was missing, but the taxi rules seemed solid, I had the combination and breakdown rules set, the dyads and triads had their possible moves trimmed down to what I thought worked best [the original had R+R movement options of 'hookrook' and planar rook, for example, but those moves were too powerful]. Good thing this is a non-competing entry, apparently. My initial thoughts, way back when, were that there was no promotion, the pawns would have to be carried off the back row by a taxi or as part of a combination piece, or using the optional pawn moves I left in the rules, should the situation ever arise. This is clearly a weakness in a *chess* variant design. Following are promotion rules. Promotion would occur on the opponent's 3-square back rank. 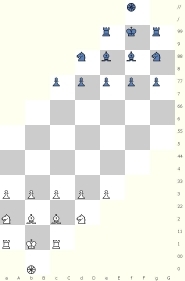 To promote, a pawn must, by itself, move onto one of the 3 promotion squares. It may not promote if brought to a promotion square by taxi or as part of a combination piece. A pawn may only promote to a rook, bishop, or knight. This is freely chosen, there are no restrictions on availability of pieces or any other such conditions. I hope this is satisfactory. What happens when Pawns can go no further? Are they promoted, or must they wait until they can be combined with something? You don't mention ny promotion, but you don't mention no promotion either. One way of getting round the 'is this really 45 squares?' question would be to allow a taxi to end a move anywhere orthogonally adjoining the board as well as anywhere on it.